We looked at some of the most popular indoor security cameras to find the best features at the lowest cost. We compared some of the most popular indoor security cameras to find the best features at the lowest cost. Find the best camera for your home. Indoor security cameras are becoming more and more popular, which also means you have more options than ever before. Is that high-end camera really worth it, or can you get by with the budget model? Do you need facial recognition when you just want to keep an eye on your mischievous basset hound? We looked through the most popular indoor security cameras on the market to find the best models with the coolest features, as well as a budget-friendly camera that will still get the job done. Logitech offers an incredibly versatile camera that you can put anywhere—and it’s packed with high-end features. When it comes to the Logitech Circle 2, versatility is the name of the game. Logitech has packed a huge array of features into one small camera. We put it on our indoor cameras list because it’s absolutely one of the best indoor cameras we’ve seen, but if you wanted to use it outdoors, you could do that too. Logitech offers several different mount options so you can put the Circle 2 basically anywhere you want. Want to stand it up on a bookshelf? Sure. Feel like sticking it on a wall? Done. How about mounting it next to a window? No problem. You can choose either a wired or a wireless model. Keep in mind the wireless model is a bit more expensive and you will have to take it down to charge regularly—or buy an extra battery. The Circle 2 has the widest field of vision of any camera on our list. With a 180° view, you can monitor an entire room with a single camera. Just remember, if you put this camera in a smaller space, the image will have a fisheye effect. So it may not be the best choice for small bedrooms or your kid’s tiny nursery. The Circle 2 is an impressive camera, but if you want all the premium features, you’ll have to subscribe to a monthly plan. Many security camera providers require monthly plans for storage and certain features, and Logitech’s Circle Safe plans are not the most expensive we’ve seen. But we still don’t love paying extra every month for features like person detection and motion zones. If you don’t want to pay for a monthly service plan, you still get basic support with Logitech’s Circle Free plan. It comes with every camera, and you don’t have to pay anything extra each month. The Circle 2 doesn’t offer a local storage option, but since the Circle Free plan allows unlimited downloads, you could just download your videos every day and store them on your computer or a separate device. Unlimited downloads also means you can share clips with friends, family, or—if you ever need to—the police. Nest makes a well-designed camera with impressive facial recognition—but you’ll pay extra for premium features. The Nest Cam IQ Indoor is the most expensive camera on our list, and it looks it. This little camera feels pretty hefty, and it will look good basically anywhere you put it. All of Nest’s products focus on beautiful design, and the IQ Indoor is no different. The IQ Indoor comes packed full of premium features—most notably, familiar face alerts. Not only can the IQ Indoor recognize when something is a person, but it can also get to know faces and recognize the ones that belong to friends and family members—as opposed to intruders coming to steal your TV. When the Nest Cam IQ Indoor does recognize a person, it uses automatic zoom (which Nest calls Supersight) to zero in on the person’s face. So when you get the video clip, you can see exactly who’s in your living room. We were also impressed by Nest’s overall function. The app was intuitive and easy to use, and there was almost no lag between the live feed and what was actually happening in the room where the camera was. If you already have a Nest learning thermostat or a Nest Protect alarm system, then the IQ Indoor camera is just one more piece of the puzzle. Nest has spent the last few years building an entire system of smart home products. Its learning thermostat is one of our favorite smart devices, and its alarm system, while expensive, is innovative and easy to use. Nest even has a video doorbell available for preorder. If you like controlling everything from a single app and having everything in your homework together, Nest is a great option for many smart home pieces, including cameras like the IQ Indoor. Most Nest things are expensive, and the IQ Indoor camera is no exception. At $299, it’s the most expensive camera on our list by far. And not only is the camera itself expensive, but you’ll also pay a substantial amount per month if you want to access all of Nest’s best features. Remember the cool familiar face recognition we talked about? Yeah, you need Nest’s service plan, Nest Aware, in order to use that. You also need a Nest Aware subscription if you want to set custom activity zones so the camera will send you special alerts. As you can see, Nest plans are substantially more expensive than Logitech’s Circle Safe plans—and more than basically every other service plan on our list. 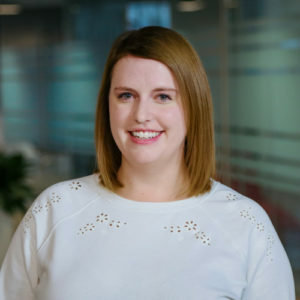 If you have other Nest devices like a thermostat or outdoor cameras, then it might be worth it to you to pay for a service that can connect them to each other. If all you want is a single camera, Nest Aware might seem too expensive. Arlo offers an array of customization options for the Arlo Q—but the app does not make it easy to set up your preferences. 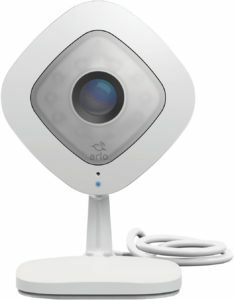 The Arlo Q is the security nerd’s friend. The camera lets you set custom modes and schedules so the camera behaves exactly how you want it to, when you want it to. Armed is exactly what it sounds like: the camera is on and watching, ready to send you alerts if it detects motion or sound. Disarmed is another obvious one: the camera is essentially off. It’s not recording and won’t send you any alerts. Schedule lets you tell your Arlo Q to turn on or off at specific times each week. If you leave for work every morning at 7:30, you can have the camera arm itself every weekday at 7:35 a.m.
Geofencing lets you set the camera depending on the location of your smartphone. If your phone leaves the house (presumably with you), the camera will arm itself. When you come home, it will disarm. If none of those modes have quite what you’re looking for, Arlo lets you make your own using rules. Rules let you determine what triggers the camera, what types of alerts it sends you, and what the camera does in response to a trigger. For example, you can set the Arlo Q to take a snapshot anytime it detects motion. Overall, the Arlo Q’s rules option is pretty cool and definitely useful. The Arlo Q doesn’t offer local storage, but it does offer seven days’ worth of cloud storage (or 1 GB worth of videos, whichever comes first) for free. Most of the cameras on our list require a monthly service plan for more storage than a day or two, so seven days is pretty good. If you do want more storage than that, Arlo’s monthly service plans are roughly on par with its competitors’ plans (and Arlo’s plans are cheaper than Nest’s). The Arlo Q Plus does have a local storage option, you’ll just pay a bit more for it. The Arlo Q has crisp HD video quality and excellent night vision. We could see an entire room clearly with the Arlo Q, while the Nest Cam IQ Indoor left that same room mostly dark beyond a few feet. That said, it’s a lightweight camera, which can be both good and bad. Personally, we prefer a camera that doesn’t feel like it’ll blow over in a brisk breeze. The camera’s cord also got in the way a bit because when we snapped it into its holder on the back of the camera base, the base couldn’t sit flat. You can still connect the cord without snapping it into the base. But it’s a bit of an oversight in the base’s design. We also noticed some serious lag time between the live feed on the app and what was actually happening in the room the camera was in. It took about five seconds for the live feed to catch up with the action. In comparison, the Nest Cam IQ Indoor did just fine using the same Wi-Fi network in the same test room. We still like the Arlo Q overall, but the design could use a little beefing up. For a cheap camera, the iSmartAlarm Spot comes with some top features—plus, you can use local storage. First things first: the iSmartAlarm Spot is cheap. At only $99 (and we’ve seen it for even less on Amazon), the Spot still gives you some remarkably good features. With 720p resolution, the Spot gives you an HD feed, and you even get 4x zoom and two-way audio. The Spot comes with a unique feature: smart sound recognition. The camera can differentiate between specific sounds such a smoke alarm or carbon monoxide detector. You don’t just get a generic “sound detected” push notification—you get a notification that tells you exactly what’s going on so you can take action. This camera also includes thoughtful extras, like a magnetic base that makes mounting on any metal surface easy, and adjustable leg stands so you can put it wherever you want. The iSmartAlarm Spot might look like a Happy Meal toy, but it’s a pretty high-tech little cube. One of the Spot’s best features is it allows you to store footage locally. That means you don’t have to subscribe to a monthly cloud storage plan to be able to review your video footage later. You just pop a microSD card into the Spot camera, and voilà, you’re good to go. That’s not to say you can’t store footage in the cloud. The Spot offers free cloud storage for up to thirty ten-second clips. The Spot is great for what it is, but what it is is still a very inexpensive camera. The camera’s plastic body feels a little cheap, and the iSmartAlarm app has a bit of a choppy user experience. That said, if you just want a cheap little camera to keep an eye on your living room and let you talk to your dog once in a while, the Spot will get the job done. Canary lets you combine some environmental security features with a decent indoor camera. 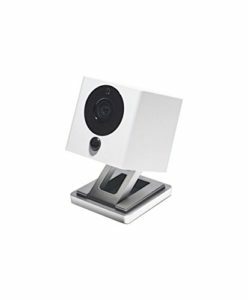 The Canary All-in-One touts itself as a home security system plus indoor camera all in one convenient little package. While we wouldn’t say it replaces a standard security system, we do think it’s a useful addition to your home—especially if you want some basic security features without arming all your doors and windows. The All-in-One comes with an indoor camera (obviously) paired with climate-monitoring sensors and a 90-decibel siren. This camera can not only keep an eye on your kitchen, but it can also tell you if there’s carbon monoxide or ethanol in your air and keep track of your home’s temperature. The Canary All-in-One has a relatively wide field of vision at 145° (although the Logitech Circle 2 still wins the day on that feature). You also get a pretty good 25-foot range for night vision, and Canary says its camera will soon support person detection as well. The best part about Canary’s person detection feature is it plans to offer it for free. 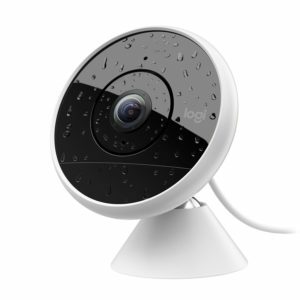 Both Nest and Logitech require a monthly service plan before you get person detection or face recognition. Canary also lets you set off a siren and call emergency services with one tap if you ever do see an intruder break into your house. At 90 decibels, the Canary’s siren isn’t the loudest we’ve seen, but if you live in an apartment, your neighbors will hear it—and it should be enough to scare off your average thief. Canary requires you to subscribe to a monthly service plan before you can use two-way audio in the Canary All-in-One. That’s weird to us—most providers don’t require subscriptions for that feature. And it’s not the only somewhat basic feature Canary doesn’t offer in its free package. The Canary All-in-One also doesn’t offer local storage. You do get 12 hours of free storage, but that’s obviously not much. The Canary Membership plan also extends your device warranty from one year to two. We think it’s a bit weird that Canary offers something like person detection (which most providers charge extra for) for free, while some basic features like two-way audio (that other providers don’t charge for) cost extra. That said, it’s still a pretty cool multi-functional system with a high-quality camera. And if you’d like to easily add environmental detectors to your house, Canary gives you an easy way to do so. The Logitech Circle 2 easily wins our Best Overall for its full array of high-tech features, reasonable price, and excellent user experience. 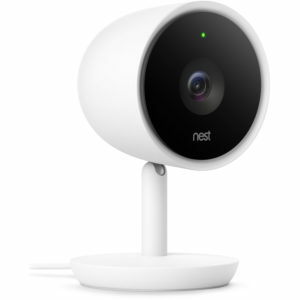 We love the Nest Cam IQ Indoor’s innovative technology and features, but the price is pretty high for what you get—and you need a monthly service plan to access all the best features. The Arlo Q is a good little camera with nice custom settings to fit your schedule—but its design feels a little subpar. The Spot is an impressively high-tech camera for such a low price point. But keep in mind, you get what you pay for. The Canary All-in-One gives you environmental security features alongside a decent HD camera. But which features cost extra and which come standard seems a bit random. If you’re looking for more specific features, check out our best motion detection camera picks, nanny cams, and our outdoor cameras review.